What Gear Will You Need To Start Boxing? How Do You Wrap Your Hand? Training to box involves learning clever techniques and intensive workouts. You start by training on the basics, and once you master them, your coach introduces you to the complex moves that turn you into a pro. To start out, you need to obtain the relevant gear and a place to train, preferably a gym with a boxing coach. Hand wraps protect your hands from injury. Without them, your wrists and fingers are in danger of spraining or even breaking from the impact of hard punches. The wrap holds the joints together, so the shock of the impacts distributes across the entire hand evenly. By reducing the free movement of the many joints in your fingers, a hand wrap helps prevent sprains. Hand wraps are essential especially if the bag you are training with is heavy. Have more than one pair to change, or they will become smelly from the sweat produced during training. To protect the knuckles of your hands, you need gloves. Punching with bare hands can result in bruised and bleeding knuckles. It can even lead to broken bones in the fingers. Gloves weighing 16oz are the most common and the standard ones. But there are other gloves with different weights which you can obtain depending on the type of workout you are doing, or your body weight. Use lighter gloves for speedy workouts or if you weigh less. You don’t have to buy a Mouth guard at first because, in the first few weeks, you have to learn basic knowledge, applying gradually those skills by punching bag or trainers. A Mouth guard will be ready when you come to a real fight. Mouth guard helps prevent your teeth from cutting into the tongue and other parts inside the mouth. Most importantly, it protects the jaw from breaking. When you spar, there’s a high likelihood of these parts getting injured. The jaw is very sensitive, and if broken, it can mean a chin that cannot stand a blow. This chin weakness can last for long. During a fight, your opponent will always aim for the chin, so you don’t want a weak one. Mouth guards are relatively cheap, ( around $20) and obtaining yours shouldn’t be a big deal. Sharing is a big NO since you never know what disease the owner carries and could transmit to you through the mouth guard. Your flexibility and mobility on the ring and during training largely depend on the shoes you wear. Light shoes with a good grip on the ground allow you to be agile enough while preventing accidental slips. They do not have to be shoes specifically designed for boxers when you’re just starting out. Look for any shoe that’s just light enough. Shoes from popular brands like Adidas and Nike are the best. The Headgear also is for the real fight, you don’t have to buy it at first. To protect your head from bruises and cuts resulting from direct punches, a Headgear is essential. In fact, it’s a must if your training is going to involve a lot of sparring sessions. Going sparring without one won’t do you any good in the long run. Have own headgear that you can keep clean easily, instead of sharing sweaty ones with other boxers. Wrapping your hands helps to keep the movable parts together to prevent injury. Left loose, impacts from punches can dislocate finger and wrist joints, or even fracture the bones. Hand wraps consist of bands of a length of between 120″ to 180″. You tie this band around your hands, just before you slip in your gloves to start training. Wrapping should be done the right way, or you may end up tightening the joints too much to allow movement. A wrap that’s too loose would also serve no purpose. It can take time to master the wrapping, but mostly, you will depend on the feeling in your hands to know if the wrap is right; the wrists and fingers should feel firm yet flexible. Here is the procedure to follow. • More wraps to the back of the hands and fingers provide extra cushioning when you’re going to have to punch hard during training. The success of your boxing training depends on how much effort you put into it and how good your coach is. A great trainer will bring out the best in you, so choose carefully. A good coach must be both your trainer and friend. Communication between the two of you should be easy. Look for a trainer with enough experience, most probably a person who has been in the boxing field for years. Such a coach knows all the boxing tricks and techniques and will pass them to you. They should have the necessary documents; passbook and the certificates. It gives credence to their profession. Choose a coach who will push your limits to unlock the potential in you but not push beyond what you can take. A coach who can easily spot the strengths and weaknesses in you. If you can find a coach who has produced famous boxers, then you’re on the way to success yourself. Such coaches are hard to find, but asking around can land you one. While in the boxing stance, quickly throw the left arm forward and straight. Move the front foot forward to coincide with the arm movement. Quickly return the hand to the guard position next to your chin. A jab is usually used as a range finder or to distract and should not be loaded with much power. Stand in the boxing stance. Move the lead foot forward while rotating your body around the hips. Pivot forward and throw your rear hand, quickly and straight. Return to boxing stance immediately. The cross loads a lot of power into it since you use your whole body to throw it, and is aimed at flooring your opponent. While still in the boxing stance, lift your lead hand elbow. Turn your lead foot knee slightly as you rotate the hips to build power into the punch. With the elbow of the lead hand lifted to be parallel to the floor and bent to 90 degrees, throw it forward in a clockwise direction. This is a left hook. Repeat its opposite to give a right hook. Hooks distract your opponent to open guard to the chin allowing you to make an uppercut. In the same stance, bend the shoulder on the lead foot side. Bend a little at the knees to give power to the punch. By bending you rear arm slightly, throw a punch from down up. Keep it straight and use the other arm to guard the head as you throw the uppercut. Retract swiftly to guard your face and return to the former stance. A slip allows you to evade opponent punches while giving you a chance to counter and quickly return to position. From a boxing stance, rotate to the left. Bend at the knees and lower the left shoulder. Crouch a little to avoid opponent’s blow and switch back to the boxing stance immediately the dodging. Starting with the boxing stance, throw the hips back and slightly bend at the knees. Rise and shift body weight to the other leg. Go back to the boxing stance. A duck helps you to evade an opponent’s punch while shifting body weight to throw your counter blows. It involves only stepping with your lead foot when moving. The rear one remains grounded, on the balls of the foot. The technique helps you to keep the balance so you can attack or defend effectively. It also prevents the crossing of the feet, or the feet coming too close together. Basic pivoting involves swinging your right foot to pivot your body weight on the lead foot. It’s used to find new lines of the target or to avoid incoming punches without having to move. Boxing is a sport that requires you to have great muscle strength, and the ability to stay active for long. To achieve this, you would need to train your body using workouts for specific parts of the body. Workouts improve your muscle strength, speed, and cardiovascular stamina, preparing you for the physical power needed on the ring. If you’re able to keep your mind and body active during a fight, you can better predict opponents moves and act accordingly. It’s a workout that helps burn fat and improve speed, coordination, and agility. Involves punching in the air in front of a mirror. Because you punch without the gloves on, your fists are lighter, allowing you to punch faster. 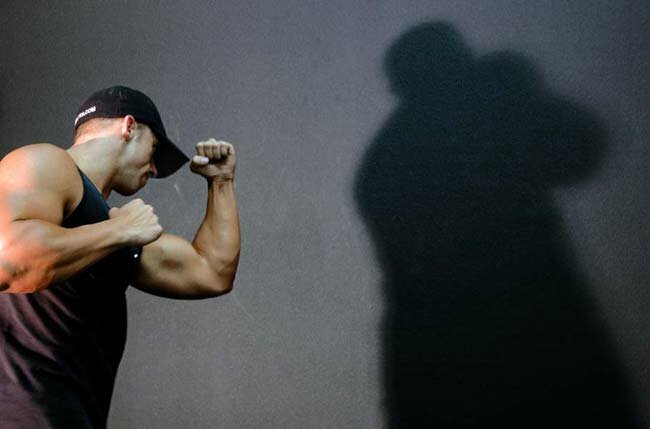 Shadow boxing is, therefore, an important workout to improve your punching speed and agility. Workouts on the heavy bag help to increase your endurance, ability to punch with power as well as coordination. You get to practice tricks of boxing you have learned. The bag also helps you to shed fat. The bag helps to improve coordination, punching accuracy, agility, endurance, and speed. The speed bag is the trickiest of all the boxing equipment. To train with it, you need to punch it just at the right time, something most beginners find difficult. Experienced boxers can punch it to a rhythm. It’s this ability to punch rhythmically that trains your body movements to be fluid and calculated. The same skill is useful when on the ring. Push ups is relatively easy, but push ups right and effectively is hard. Pushups develop and strengthen the muscles of the upper body. These are the muscles you use to throw punches, and if they’re weak, it can mean ineffective punches. Pushups can be performed anywhere and even without the supervision of a coach. Sit ups work the core of your body. You depend on the core for balance and to shift weight to give power to punches. Situps should be done one a regular basis. VO2 Max is a measurement of oxygen volume that a trainer, runner or athlete can take. It plays a vital role in the daily activity of a boxer such as running, cardio and punching. In here, we talk about the punch first. With higher VO2 Max level, your body can deliver enough oxygen to muscle to perform a powerful punch. How you breath when punching is important. It is what keeps you awake and active during a fight. Proper breathing helps you coordinate and give power to your punches. Learning the right breathing technique is important to keep oxygen flowing in your blood. Breath slowly; it helps to keep you calm and relaxed, so you don’t panic and lose a fight. There are situations when quick breathing is necessary, like when having a quick exchange of punches. When releasing a punch, exhale sharply to coincide with the movement. Breathing should always be through the nose, unless circumstance forces you to do it through the mouth. Breathing through an open mouth exposes it to injury from an uppercut, should your opponent aim one to your chin. Never ignore the basics. Some beginners find boxing basics boring and want to skip them. Without mastering the basic techniques, you will find learning complex boxing tricks hard for you. Basics are what will make you progress faster, so learn them first. Always try to avoid injuries. Don’t just take in punches; you aren’t a punching bag. Instead, make use of ducks and slips to evade as many as you can. Charge at your opponent savagely; it will lessen the number of punches they throw at you. Make workouts moderate. Beginners falsely think that training intensively equal to more gains. On the contrary, it may even harm your health. Keep it minimal, and follow the directions of your coach. Don’t be afraid to spar. In your boxing career, you will compete with humans, not punching bags. Take every sparring opportunity you can get hold of. Sparring builds your confidence, plus it gives you the chance to practice your newly learned skills. Practicing alone at home is cheaper and allows you more time for workouts. It doesn’t replace the gym, though, or the coach. It only supplements. You will not need fancy equipment, just some space, boxing gear, and some bags. The heavy bag helps improve coordination, speed, endurance, and punching power. It’s a cylindrical, round-bottomed training bag that hangs on a stand. It can also hang from the ceiling if a stand is not available. The inside of the bag is usually filled with material strong enough to make it withstand constant punching without damage. As its name denotes, it helps improve uppercut techniques. It’s pretty much like the heavy bag, only that it hangs in a horizontal position while the heavy bag usually hangs vertically. It’s a small bag that has various shapes. Sizes vary too, but it isn’t as big as the heavy bag and the uppercut bag. One end hooks to the ceiling while the other end attaches to the floor. The bag is used to train for coordination and speed. It’s similar to the heavy bag, but just like its name, it stands on its own. They are mobile and are preferred to the heavy bag when space is a problem, or if you live in a rented house where you can’t make holes in the ceiling to attach your bag. This is an essential gear of boxing training. These Jump rope, dumbbell, etc.. support you to develop specific muscle, facilitating your punching and movement. Once you acquire your equipment, you can start training right away. Here is a typical workout routine you can adopt. • Work out the upper body muscles using the appropriate muscles. Each round should take not more than 3 minutes. But it depends on how comfortable you’re with the workout intensity.